"Walker" is the long poem that closes Patrick's debut collection The Mains. The poem began life as an elegy for the actor James Beck, who played the part of Joe Walker in Dad’s Army, before taking on a darker, more personal life of its own. The story of "Walker" starts halfway through its life, with a logic that only poets may accept as anything other than wilfully obtuse. And certainly not all poets. I’d written 32 stanzas of the poem, and was having a drink one windy evening in an odd and gothic hotel just off the Bayswater Road with Fiona Sampson. All stories, really, should start like this. Why 32? Because in early 2016 I slipped into the beginnings of a mental breakdown that eventually resulted in hospitalisation – so far so Lowell – an early warning sign of which should have been the time that I spent alone, late at night, staring at a wooden chessboard leant against the wall across the silent living room from me. At one point something in me decided that the odd little military, spiky-sexual poems that I was writing would make sense (always a warning sign that the poet is not well; that lust for sensibility) if assigned pieces of the chess armies. This worked for about five or six of them, which have survived into The Mains, but inevitably I then started writing poems for the chess pieces, before feeding them backwards through the garlic-press of semantic denial and overwrought symbolism known as The Poet’s Redrafting Process. And anyway, once I’d done the 16 (fast stopping being my lucky number) on each side, I still had the 32 squares of no-man’s-land in the middle. What to do. Well, obviously, a punctuation-less half-elegy for the Dad’s Army actor James Beck – he of Joe Walker the Spiv, of London Stage plaudits, and the first of the gang to die. Obviously. What else made sense? And if the poem also included something of an unconscious travel-guide to the subconscious meltdown of my then-state, or looked at the worst things in me and of me, past and present, and then conjured a spectre of that spiv and wheeler-dealer, to chase me to the end of the poem and inflict far more than could be endured? Well, obviously that made sense too. To spines, then. The Mains takes its title from a poem concerning my nightmare since childhood of the exposed, slit-to and bared spinal cord. There is a poem not in the book (though it and I tried) exploring the idea of one of John Franklin’s crew performing the wondered-at Viking punishment of the Blood Eagle on a crewmate (rather than eating him, was my defence of this macabre exercise, or, at least, before eating him) in some sacrificial attempt to get them out of the ice. It’s a poem that I wrote at breakneck speed and edited to near non-existence. On the one hand it does tell the story of James Beck. But it also opens up Walker the Spiv himself. I believe that tricksters find their poet, and that Walker is mine. James Beck took on Private Joe Walker in Dad’s Army once Jimmy Perry, the writer of the show, accepted that he could not (for reasons both of nepotism and talent) play the role himself. Before the first shot of him is made in the series, the bitter wrenching of Walker from writer is present. Joe Walker is the only character in Dad’s Army who should be fighting a real war, in the army, not entertaining pensionable or schoolboy fantasies of last-ditch stands in the home guard. 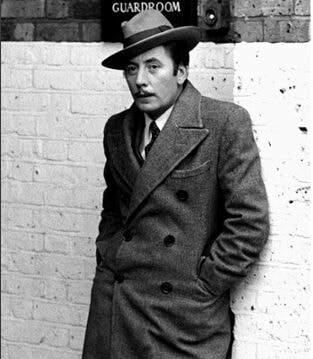 James Beck himself was almost the only actor in the cast of that show who should have been acting at the National Theatre, and on Broadway, rather than attempting career salvage, late in the day. Olivier said that Beck’s Archie Rice (a role Larry had originated) was the best he had ever seen. Beck’s Shylock was the talk of a whole theatrical season. And yet James was an honourable man. He stayed with the spiv, he drank a lot (as did they all), and he died in the role. Waste, then; waste born of kindness and the fore cursor to rage. At least to me. That sense of waste is part of the mirror in the poem. My younger years, my London years, my slip-to-madness years, as they appear in the poem are half-mirror of that waste. As any other person aware that the boat has sailed on fulfilling potential will be aware, the temptation to imagine that like Beck we have wasted because of loyalty and good intention, sentiment, and that’s why we are as we are, is a strong one. It is also a lie – a fact that I certainly knew at the end of writing the poem. Perhaps I knew it all along. Walker the Spiv. Spivs. They were cheeky chappies and all that. But they weren’t. They formed gangs and killed people, they fed addiction and exploitation. They pimped and killed and they dressed in stripes more expensive than officer or inmate. This is the Walker that pursued me, that kills repeatedly in the poem with the ‘90s-childhood imagery of fear: the talking, Goosebumps ventriloquist dummy, the Loaded-lad cockney offers of deal and cost. They scared me then and they still do. Fear is for me the universal concern of subject and writer. It is a far commoner thing to be able to scare a room of twenty people than to make one of them love; and that goes for all walks of life and times of day. So the second mirror is thus. It’s a poem written entirely on a computer. There are no notes or handwritten bits of "Walker". Eventually the hammering of the keys either convinces the poet or it doesn’t, and for me it has. The poet Rob Selby, who was the second person to read Walker, and I once agreed that while we possess post-notebook guilt, finding the right computer to write on is an identical aim and experience to the first sight of something bound and Byronic in Paperchase. While writing the poem, I was asked at an event I was reading at ‘What advice would you give young poets?’ There’s only one answer to that – ‘Beat the Moleskine addiction early on and you’ll be happier’. These days I would add ‘Be ok with composing using your laptop – the only reason Keats didn’t was because they weren’t invented yet’. You write poetry, not poems. At least that’s how it’s been with me. "Walker" is my only experience of the two ideas cohabiting. I knew that it was one poem, but the length of the thing, the way that it was written, was the same as how writing the other 28 poems in the book was. The sense of graft and that of calling, so often at war in the poet, were for once (and it’s been my only experience of it so far) allies. "Walker" didn’t fix me. If anything it made things worse – self-awareness, after all, just puts you in the audience with everyone else. And he’s not gone, which is something that I had honestly hoped would happen. I’d probably built him at least in theory either as a sin eater or as a scapegoat. That’s what had animated the hands. I might meet him again tomorrow or next year. But for some reason I don’t think I could write him again. That eye to the flame no longer exists and I am yet to assess the worth of that lack. On the other hand, Fiona was right. "Walker" is the book. Flesh and bone.